Cox Automotive presented Ford’s Linda Silverstein with its 12th annual Barbara Cox Automotive Woman of the Year Award during a breakfast at the NADA Convention on Saturday. The remarketing and rental operations general manager was recognized for her business leadership, community advocacy and commitment to advancing the automotive industry. “Linda is exactly the type of professional the automotive industry needs more of. By sharing her experiences through mentoring, she is helping develop future leaders,” said Cox Automotive president Sandy Schwartz. Schwartz gave Silverstein her award during the Northwood University Dealer Education Award annual breakfast at NADA. Silverstein began her career at the Ford Motor Co. in 1982 as an analyst in Ford Division's Detroit District Sales Office. Since, she’s held a variety of marketing and sales positions at Ford Division and Lincoln Mercury Division in Atlanta, Detroit and San Francisco. Silverstein has been responsible for Ford’s vehicle remarketing since 2002, certified pre-owned since 2005 and rental operations since 2007. “To be recognized for my participation in an industry that I love is quite an honor,” said Silverstein. “I often tell people that are just starting their careers that if they are passionate about what they do, they will never work a day in their life. I am passionate about the auto industry…it’s fast pace and the ever-changing nature of the business — coupled with great people — make it a fun and rewarding industry to be a part of. In 2009, Silverstein was inducted into the National Auto Auction Association Hall of Fame. She was also recognized as 2010 Consignor of the Year and was honored as a Warren Young Fellow. In addition to presenting the Woman of the Year Award to Silverstein, Cox Automotive gifted a $10,000 scholarship to Alesandra D'Agostino, a Northwood University student. D’Agostino is a junior studying automotive retail management and automotive aftermarket management who is active in her community by volunteering at a crisis shelter and soup kitchen as well as Rake a Difference, which helps seniors and individuals with disabilities. ADESA’s auction at the NADA Convention and Expo on Saturday raised $94,423 for the NADA Foundation’s Frank E. McCarthy Memorial Fund, which supports Canine Companions for Independence — a non-profit organization that provides people with disabilities highly trained service dogs. Easterns Automotive Group in Sterling, Va. founder Robert Bassam, placed the first winning bid of $39,000 for a 2015 Polaris utility task vehicle. Joe Verde, president of Joe Verde Group in San Juan Capistrano, Calif., placed the second winning bid of $26,000. Joel Bassam, Bassam’s son, director of marketing for Easterns Automotive Group, placed the final winning bid of $28,000. Attendees’ $1,423 in cash donations to brought the final contribution to $94,423. “I can go out and do things and leave the house because I have him. Canine Companions has made this possible for veterans and so many other people with disabilities,” said Retired Army Sgt. Steve Blackman. Blackman who suffered a traumatic brain injury while in service represented Canine Companions at the auction with his service dog, Gottlieb. “My life has completely changed. No longer do I wake every morning wondering what the day is going to bring and if I can make it through it because I have Gottlieb,” said Blackman. At the past six NADA conventions, ADESA said it has raised more than $334,400 for the NADA Foundation’s Frank E. McCarthy Memorial Fund. McCarthy was NADA chief executive from 1968 to 2001. Cox Automotive and Jive Software will discuss best practices for building an engaged workforce in a free live webinar next Thursday entitled, "Building an Engaged Workforce at Cox Automotive." Cox Automotive communications manager Billy Auer will join Darshita Maniar, senior manager of product marketing at Jive Software, to examine the tools and technologies used to support employees through their careers at the company as well as how to overcome organizational fragmentation due to differing locations, devices and workstyles. "With so many brands on one unified hub, we have a place for everything from communication to knowledge-sharing to social interaction across our entire organization," said Auer. "This has allowed us to not only better unite as a company, but also harness collaboration across brands, teams and locations in a way that helps everyone work better together." Cox Automotive uses Jive, a provider of modern communication and collaboration solutions for business, to help maintain its vital human resources and corporate communications objectives, such as implementing company culture and broadening employee engagement. For more information regarding the upcoming webinar and registration visit Jive’s "Building an Engaged Workforce at Cox Automotive" webpage. On Tuesday, AutoNation announced that the country music group Eli Young Band is scheduled to perform at its AutoNation Cure Bowl Tailgate Party and Concert, a benefit for breast cancer research. "We are pleased to join AutoNation in the fight against cancer,” said the Eli Young Band in a statement. “This disease hits close to home for many people, so being a part of raising awareness is very important to us." AutoNation is donating to the Breast Cancer Research Foundation and has committed a total of $2,000,000 to the organization, the largest private funder of breast cancer research. The second annual event is on Dec. 17 at Tinker Field in Orlando, Fla.
Tickets can be purchased at CureBowl.com. Eli Young Band has gone double platinum and holds a Grammy nomination for Best Country Duo/Group Performance. Jim Hallett, KAR Auction Services chairman and chief executive officer gave a keynote address during the Fleet Europe Remarketing Forum in Barcelona on Nov. 15. Hallett spoke of his thoughts concerning the future of automotive remarketing based on more than 40 years of industry experience and what he’s learned as the leader of KAR Auction Services. He also explained building the company from a single auction into a multi-national technology company to one focused on innovation, data science and service. And shared insight regarding KAR’s integrated approach to remarketing through the company’s three main business units, ADESA, Automotive Finance Company (AFC) and Insurance Auto Auctions (IAA). Annually, the Remarketing Forum gathers 150 industry professionals from a variety sections within the remarketing industry, such as OEMs, residual value setters and consultants, vehicle leasing companies, car rental companies, remarketing insurance providers, connect and trade insight about significant industry topics. The forum was hosted at the Catalunya Congress Center in Barcelona. Cox Automotive has three events remaining in its 2016 Interactive Dealer Summit and Elevate program series. Each event is designed to help dealers attain profitability and advance their wholesale and retail operations in the face of declining margins and growing consumer expectations for the buying experience. — The Philadelphia Interactive Dealer Summit in King of Prussia, Pa., on Nov. 16. — The City of Industry Elevate Dealer Summit in City of Industry, Calif., on Dec. 6. — The Universal City Elevate Dealer Summit in Universal City, Calif., on Dec. 8. "We absorbed a lot of information and the topics were spot on," said Tim Watson, IT and digital marketing at Portland Volvo and Southern Maine Chrysler Dodge Jeep Ram. "I was able to come back to the dealership and put the best practices I'd learned into place right away, and we're already starting to see results. If dealers have the opportunity to attend an event this year, I can't recommend it highly enough." Specific topics arranged to be discussed at the three events include improving staff training to elevate dealership performance; reducing days to sell and increasing inventory turns; and increasing consumer demand by improving the buying experience, both online and offline. The events are open to the general dealer public and will consist of breakout sessions, keynote speakers and networking opportunities. Dealers can also register to view the Nov. 16 summit live via simulcast. For information about the Interactive Dealer Summit and Elevate programs and the upcoming events visit www.dealerlearningcenter.com. There have been some big changes to the digital marketing landscape — ones that certainly impact dealers, says Kerri Wise, TrueCar's vice president of dealer marketing. 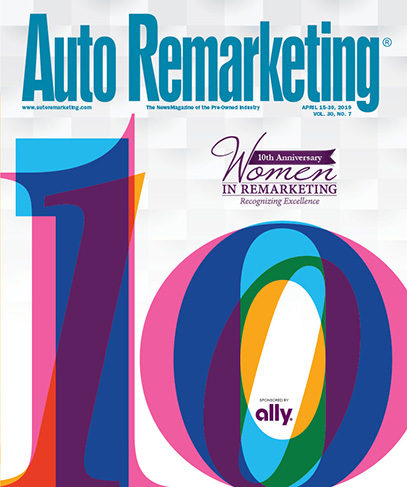 “We're in the era of the empowered consumer,” Wise said in a phone interview with Auto Remarketing. “And I think the consumer is really what's changing. “They have a lot of information at their fingertips, in terms of pricing information and vehicle information,” she said. “They have technology that's ever-evolving that allows them to have that information wherever they go, in terms of their smartphone. In fact, TrueCar recently conducted a study of its dealer partners that closed sales at the highest rates (relative to competitors). The company found that these dealers were the ones who were strongest at “meeting needs of that empowered consumer and connecting the dots between what happens online and then what happens off-line, in the store — which is a much more difficult thing to do these days,” Wise said. Wise will discuss this concept of the “evolving consumer” further during her presentation at the CPO Forum, part of the Used Car Week Conferences being held Nov. 14-18 at the Red Rock Casino, Resort & Spa in Las Vegas. Her session — titled “Key Tactics to Compete and Win in Today's Transparent Marketplace” — will be held at 4 p.m. (PT) on Nov. 15. “One of the advantages that we have at TrueCar is that we're watching some of the patterns of consumers from shopping all the way through the sale,” she said. “And so we learn a lot about not only how they shop, but how they're changing. And so I'm going to be using some of that insight from consumers as well as our observations and studying of our top-performing dealers to understand how these top-performing dealers close at a high percent in a transparent way,” Wise said. “It's easier said than done. “We'll be looking at these consumer insights, combined with these best practices from real dealers that are balancing transparency and balancing their bottom line, and sharing that with the audience in terms of what makes them successful,” she said. This year, hundreds of independent dealers who previously attended Innovate: The Independent Dealer Conference will instead set their sights on DealerSocket’s User Summit. The seventh annual conference will host dealers from both the franchised and independent space with more than 1,100 guests expected. This is the first year that User Summit attendees will be able to choose an independent track (from more than 70 total classes) that highlights today’s most pressing compliance issues, industry insights and best practices from other dealers, as well as new independent technology. Breakout sessions will cover the latest developments in compliance; digital marketing; customer experience; DMS, CRM and inventory management technology; business management; sales and marketing; and more. There is even a track covering the sales, service, F&I and collections concerns of buy-here-pay-here dealers. “We are thrilled to expand our annual User Summit to welcome former Innovate attendees into the fold. Last year, we introduced a small selection of independent classes, but starting this year, we are officially merging with Innovate and multiplying our schedule to include a Texas-sized offering for independent attendees,” said Peter Ord, national sales director, independent at DealerSocket. “Whether you are a member of the DealerSocket family or just interested in educating yourself on the issues facing your business, User Summit will prepare you for the future of independent,” Ord continued. Among what's in store, DealerSocket will officially launch Blackbird at this year’s event, complete with on-site demos. Blackbird includes the company’s brand-new CRM, as well as the long-awaited iDMS. DealerSocket will also release its second annual Independent Dealership Action Report, a comprehensive, data-packed guide on the state of today’s independent industry and how dealers can thrive amid its challenges. User Summit 2016 will take place Oct. 3-5 at the JW Marriott San Antonio Hill Country Resort and Spa. For more information or to register, visit http://usersummit.dealersocket.com/ind.